Two weeks from today, voters will go to the polls to vote for everything from local school board and town dogcatcher to senator and governor. No one can credibly say that this election will be all about cigar rights or tobacco issues, but that doesn’t mean cigar smokers can’t use the opportunity to make their voices heard. For those who doubt that elections matter, you might re-read our story from two years ago about Obama and McCain’s positions on key cigar issues. We predicted that under Obama the SCHIP tax and FDA regulation of tobacco would be signed into law, and that Obama would make some initial steps toward normalizing relations with Cuba—all of which came true. Find out where your candidates stand on important issues like cigar taxes and smoking bans. The easiest way to predict how a politician will vote in the future is to see how they voted in the past. If a candidate hasn’t held office before or hasn’t made any votes on the issue, the next best indicators are public statements either in a news article or on a the candidate’s website. Also, look to see who is supporting their campaign with contributions. If local restaurant associations support them, it’s probably a good sign that they’re against local smoking bans, while if a local anti-smoking group is saying good things about a candidate, it usually means they’ve pledged to support smoking restrictions. Finally, you can always call and ask a candidate’s position, but be aware that politicians are likely to tell potential voters what they think they want to hear, so take any answer you get with a grain of salt. Focusing your attention on smaller races has many advantages. First, with the FDA bill and SCHIP tax having already passed Congress, most of the action is taking place on the state and local level where anti-tobacco activists are looking to expand smoking bans to restaurants, bars, and even outdoor locations. Second, in smaller races there are fewer voters, which means your vote and that of your fellow cigar smokers can have a large impact. Invite your local candidates down to your cigar shop and ask them tough questions about their view of the role of government when it comes to smoking (and be sure the shop is particularly busy that day). They may be glad to get the chance to meet with groups of voters, but it will also remind them that anti-tobacco laws have victims, and that those victims vote. Politicians are more responsive to their constituents in the run-up to Election Day. That makes now the best time to let all the candidates, whether friendly to cigar smokers or not, know that smoking bans and tobacco taxes are important to you. When key votes come, you want politicians to be forced to consider the consequences at the ballot box. For years the anti-smoking lobby has been very vocal as they push for higher taxes, smoking bans, and other laws that take us closer and closer to complete prohibition of smoking. The key to reversing the trend is applying pressure in the other direction, so that politicians know that appeasing the anti-tobacco zealots will have consequences. 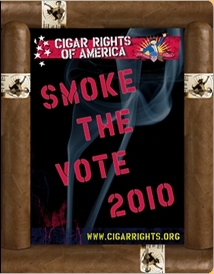 Groups like Cigar Rights of America can help with activities like their Smoke the Vote campaign. Ultimately, though, individual smokers need to make their voices heard so cigar smokers can become a meaningful consideration for candidates looking to get elected. Keep that in mind in the next two weeks, on Election Day, and every day thereafter. I can't stand McCain, but man it would have been good to have in the Whitehouse to veto SCHIP and the FDA bill.